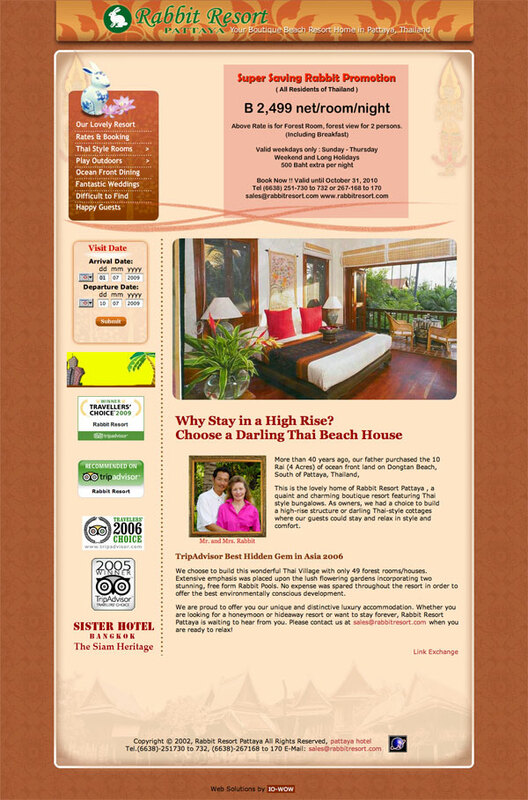 Thai Beach Houses on luxury Dongtan Beach – the best beach in Pattaya.We are the last Thai beach house resort left in Pattaya, everyone else has built high rises. Why stay in a concrete high rise? Instead stay in a darling Thai Beach House. All rooms and houses are individually designed, no two are alike. We did extensive consumer research before building and the outcome indicated that guests wanted to experience a Thai lifestyle when they are in Thailand. There are two separate pools – one quiet one for adults and one fun one for families. Everyone loves this arrangement. Service = Kindness. We are a family owned and operated resort that stresses personal attention. We provide assistance and service for traveling guests. The owners live at the resort and they take a daily active role in running the hotel. Most of our staff have been with us 5-10 years, many of them live on site to provide the best possible service. Rabbit Resort is so wonderful!! This site is reviews of Rabbit Resort.